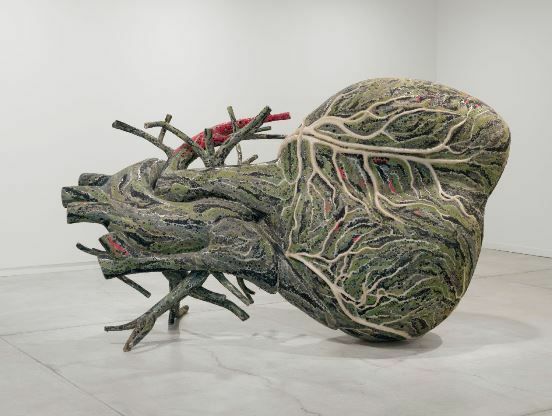 From 20 April to 9 September, Bharti Kher presents a solo exhibition at the DHC/ART Foundation for Contemporary Art in Montreal. Points de départ, points qui lient brings together a group of paintings and sculptures which are a celebration of Kher’s work with the bindi. Kher’s practice responds to the human tendency to define life experience along rigid lines (culture, gender, morality and so on) by creating complex and hybrid forms and surfaces. She draws together important cultural signifiers to produce multilayered messages, which can be interpreted in multiple ways. In doing so, she draws attention to, challenges and blurs the lines of definition. The bindi is a recurring motif in Kher’s work. Originally made from natural pigment powder, now mass-produced, the bindi combines a ubiquitous form (a dot) with deep religious, cultural and ritual significance. It is traditionally applied to the forehead to represent a spiritual third eye, and has conceptual links with femininity. By multiplying and layering the bindi, Kher brings it into contact with the geometric language of abstract painting. In doing so she builds a language around the bindi, amplifying the tantric and neo-tantric traditions of India and connecting them formally with the languages - and in a ripple effect the cultural and philosophical systems - that underpin Western painting and sculpture. The resulting formal hybridity is challenging and thought provoking, colourful and beautiful, and dynamic in that at any given moment it is significant in different ways for different people.